At just 28 years old, best friends and business partners Joe Kennedy and Jonny Burt are single-handedly revolutionising the contemporary art world. They’re model-good looking, disarmingly charming and wildly ambitious. ‘We sat down and tried to figure out what problems we wanted to solve in the art world, what we didn’t like and what we could change’, explains Joe excitedly, as he guides me round their new Mayfair flagship – the former 6000 sq ft Citi Bank building in Hanover Square. ‘We wanted to be inclusive, celebrate genuine artistic talent and bring back the human experience into the [art] industry’. In five short years, they have done just that. Starting life as a pop-up in Chiswick in 2013, later moving to Soho and Covent Garden, Unit London is now one of the biggest contemporary art galleries in London. With no financial backing, the new Mayfair flagship is the culmination of a lot of late nights, serious hard graft and cold calling landlords, the duo reveal. ‘We have built this space and designed it to be exactly what we want it to be: the most impressive gallery space in London’, Joe affirms. Spanning two floors, it's certainly impressive. Boasting a harmonious mix of old and new, the original characteristics of the space sing. Polished floors are in perfect opposition with imperfect ceilings, while curved, floating underlit walls prevent it from feeling unwelcoming and sterile. But Unit London is so much more than a gallery space, it’s more of a creative hub, a brand, an ideology explains Joe. ‘We wanted to [create something that was] inclusive, celebrate genuine talent and bring back the human experience into the industry'. It seems, that at its core, Unit London is aiming to connect people with arts and culture in a digital age. 'It’s all about mass engagement’, explains Jonny. ‘That’s our big thing [...] the future of art, is art for everyone'. Widely praised for refuting the elitism typically associated with the art world, Unit London has carved its niche by creating an accessible platform for bold, innovative and experimental artists, as well as for a tech savvy millennial audience. So, how exactly did they build their burgeoning empire? ‘When we started the only tool at our disposal was social media’, exclaims Joe. ‘It wasn't a conscious decision but as outsiders in the industry there was no other foothold for us. We know what we like, what artists to champion and the stories we want to tell. Once you’ve established a brand message and consistent communication with your audience, the sales follow’. And sales are, despite their core values, paramount to their success as a business. The Unit London Instagram account gets more than 5 million impressions a week from a totally global audience, and more than 100 messages a day from private buyers inquiring about artworks for sale. 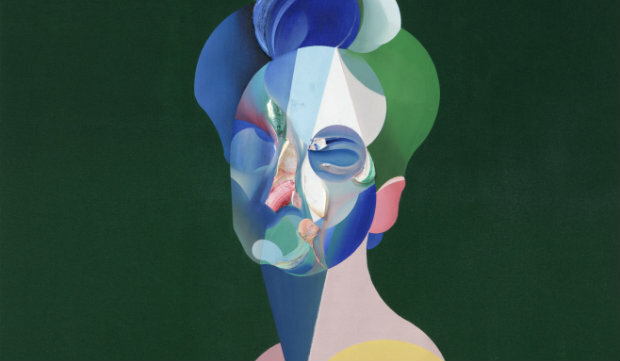 Jonny lets slip that their upcoming Ryan Hewett solo show is almost sold out, and that they’ve connected with some of the biggest collectors in the world on Instagram. It would seem, then, given the growing number of online sales and number of galleries closing shop in the area, that opening a 6,000 sq ft gallery space is counter-trend, counter-productive even. But the boys steadfastly emphasise the importance of a physical space, even in a digital world. ‘A Mayfair gallery gives us credibility’, exclaims Joe. ‘It’s [also] exciting for us to take our values, our ethos, our design principles, our communication strategy, and put it into the heart of Mayfair. It's not like being in enemy turf, but it has that kind of feeling to it'. ‘We are really going in there to disrupt, but not in a reckless way’, adds partner-in-crime Jonny, ‘We didn’t want to create a White Cube space, but an immersive experiential showroom [...] We’re creating a temple for our artists’. And what a temple it is. Among their primary roster of well-known and international names to garnish the floating curved walls are British artist Jake Wood-Evans, HUSH – a graffiti artist focusing on female sexuality and transience in contemporary art – and South African abstract figurative painter Ryan Hewett. Hewett, as with many of their artists, was scouted online. 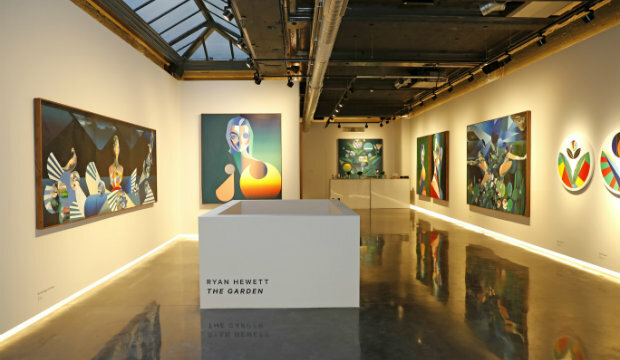 He was also given the tough job of inaugurating the swanky new space, with a solo exhibition of new brightly-saturated oil paintings, drawing on continued notions of fantasy and surrealism. The duo's second exhibition, hot on the heels of the first, brings together eight international artists exploring art in a digital age. Unsurprisingly, all of them were scouted out on social platforms, too, using the gallery’s far-reaching social media initiative, #lookingforU. Philip Colbert, renowned for his work juxtaposing contemporary motifs with art historical references, painter Marc Gumpinger and mixed-media artist Tom Price are all participating in the show. All eight artists have produced work in response to the exhibition's themes of identity and communication in the modern age. So what’s next? More secondary market deals and an overseas outposts? Yes. But first, ‘our focus is on the artists we are working with’, explains Jonny, ‘we want to turn them into superstars, we want to turn them into generation defining artists [...] we want to create an immersive experience that gives a big, powerful voice to our artists'. Refreshing, ambitious, and certainly revolutionary: Joe and Jonny, we salute you.